McCullough finished renovating this nearly 100 year old building in the heart of downtown McPherson Square in May of 2018. 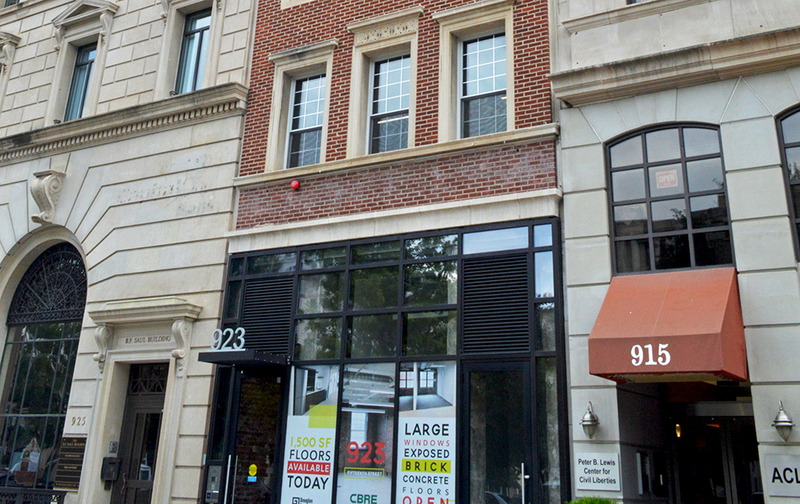 The first floor provides approximately 1,600 SF of retail, while floors 2-6 are office space (9,100 SF). The building itself is composed of brick, cast stone and glass storefront. Inside, there is an industrial vibe, which includes exposed ceilings & brick walls, as well as concrete floors. The building stands just a few blocks from the White House in Northwest DC, which proved to be one of its major challenges in terms of space constraints. Another challenge on this project was preserving the existing façade while carefully removing the old cast stone at ground floor, which was supporting everything above it, in order to add a larger all-glass storefront. McCullough also had to carefully feed the new steel supports for the structure through the front windows on each floor via crane on a very busy, tight street.